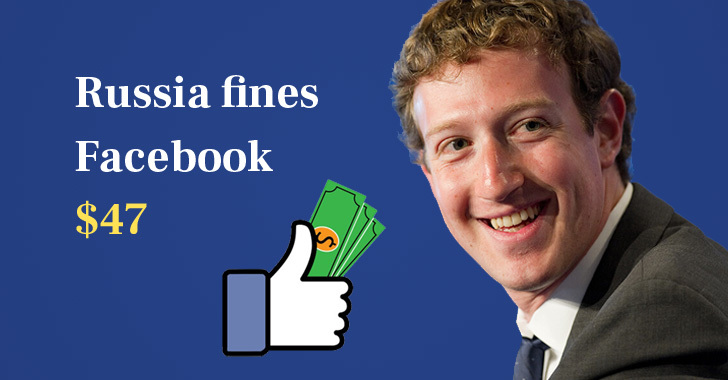 Russia has fined Facebook with 3,000 rubles, roughly $47, for not complying with the country's controversial Data Localization law. It's bizarre and unbelievable, but true. Though the social media platforms had one month to reply, they choose not to disclose this information, as a result of which Moscow's Tagansky District Court imposed 3,000 rubles fine on Twitter last week and the same on Facebook today. In July 2014, Russia approved amendments to the Russian Personal Data Law which came into force in 1st September 2015, under which foreign tech companies were required to store the personal data of its citizens within the country's borders. Although the fine imposed on Facebook and Twitter may seem nothing, further refusal to comply with the country's data localization law could result in much more serious repercussions, like Russia can ban social media companies, just like it banned LinkedIn in late 2016. Russia is not the first country to enforce such law on foreign tech companies. In May 2016, Iran also imposed new regulations on all foreign messaging and social media apps to move 'data and activity' associated with Iranian citizens onto servers in Iran within one year. China also passed amendments for data localization in late 2016 that would force "critical information infrastructure operators" to store its citizens' data within the nation's borders.